As some of you know, I love Vera Lane Studio digital stamps - they are fun, quirky, odd and there are lots of zombie and coffee themed images to play with. This month, in the Vera Lane Studio Facebook Group, there is a Coffee ATC Challenge. Coffee and zombies. My two favorite words. But a coffee loving zombie is so much more fun and that is what today's project is all about. Hence the coffee and zombie! As much as I would have liked to have used real coffee stained paper for this project, I have yet to try that, so I started by printing a free coffee stained digital paper I had in my stash and then cutting it to an ATC size - 2.5" x 3.5". I also distressed the edges with vintage photo distress ink (Holtz/Ranger). Using the Calacas Digi Stamp Bundle - I printed two of the zombie images, along with some of the coffee cups, and the phrase. I then fussy cut the zombie, the flower from the 2nd zombie, and 5 of the cups. (In the end, I don't use the 2nd flower, I use more cups and more of the word "coffee"). I then colored in the cups and the zombie using a variety of BIC Ultra Fine and Fine Markers -Fandango Pink, Lime Sorbet, Sunset Orange, Yellow Blaze, Hot Aqua, Rambunctious Red, and Margarita Green. I also used Copic R00 Pinkish White on the face. I cut a slit in the top of each cup so that the next cup can fit inside a bit. I adhered these down to the ATC and then I inserted the zombie, after cutting off his legs. Ouch! Next, I needed some words for the ATC. I didn't print enough of the phrase so I printed a few more, cut them out and distressed the edges. I did a test with the words but both myself and my friend Debra decided it was too blah...doesn't POP! It needed more color. So I took a piece of scrap cardstock and colored in some of the BIC Markers that I used so that I could layer the words on each color. Much better. I adhered the words to each of the colors, cut them out, and adhered them on the right side of the ATC. I ended up not having enough room for one of the colors. As a last minute idea, I adhered some Yellow, Orange Peel, Firefly, and Glam Pink Stickles (Ranger) on each of the cups to give a slight shimmer. Here is the final ATC....when I was adhering the ATC info on the back, the googly eyes fell off so I adhered even bigger eyes! I think it looks even better now. Hello everyone and Happy Day of the Dead or Dia de Los Muertos (Spanish) or Dia dos Mortos (Portuguese) - depending on where you live or what language you speak. I love this holiday and I love the idea of a special day to remember and celebrate those that have passed before us. Most people consider this a Mexican holiday but it is celebrated in many other parts of the world. In the states it's called All Souls Day but parts of the USA in the Midwest and south also celebrate Day of the Dead because of the Mexican influence. Here in Brasil it's a public holiday, also called Finados, and is similar to other Day of the Dead celebrations. Many people go to cemeteries and churches with flowers and candles and offer prayers. The celebration is intended to honor the dead. Memorializing the dead draws from indigenous, African and European Catholic origins. There is a lot to learn about the Day of the Dead and, if you are interested, you can click on THIS LINK that will take you to a great Wikipedia page that explains it all in detail. I wanted to make something easy and colorful for this day and I made a card front to put up on the wall. 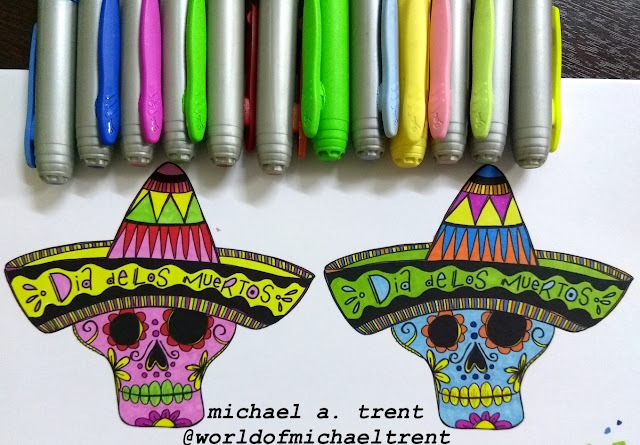 I started by printing two of these Sombrero Skulls (Vera Lane Studio on Etsy) on to white cardstock and coloring them with my Ultra Fine Tip BIC Markers (my fav). I cut a piece of black cardstock, 4 7/8" x 6 7/8", and embossed it with the Shady Allure Embossing Folder (Spellbinders/E3D-019/Retired). Then I adhered a piece of black fun foam to the back and then adhered this to a piece of purple cardstock, 5" x 7". I also fussy cut the two skulls and adhered them to the black cardstock with pop dots. And the final thing I did was to add some Stickles (Ranger) to various parts of the hat and face to add some shimmer. And here is the final piece after everything dried. I think this is going to go on a shelf or the wall. I love the black embossed background and I really love the bright skulls popping off of it.